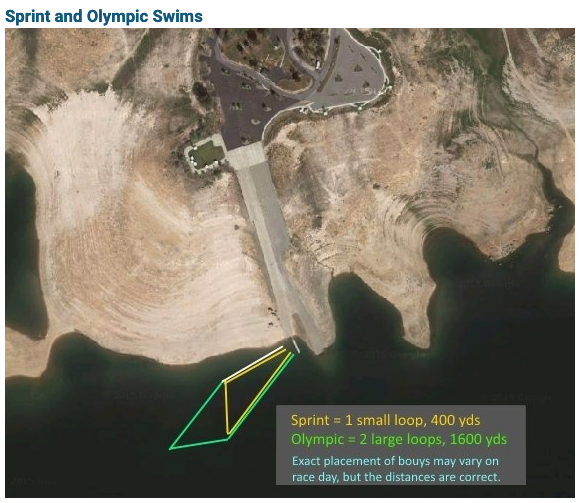 Swim: Beginning in the water at Millerton, athletes will utilize Millerton Lake Boat Launch. Participants swim around buoys for 400 yards, exit the water at the boat ramp and proceed to the Transition Area. 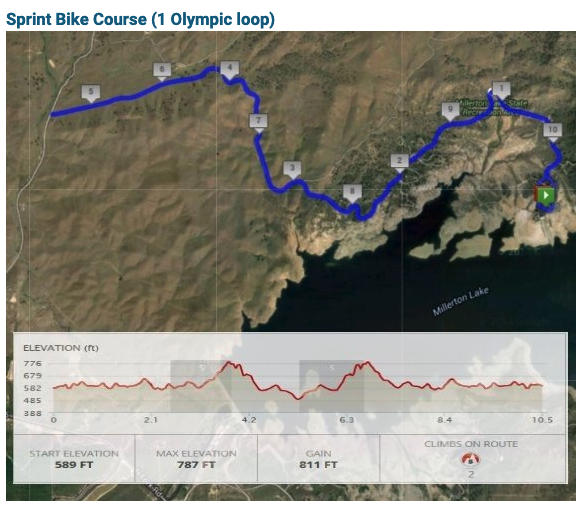 Bike: Beginning at the Transition Area, athletes will make their way north towards the Millerton park entrance and proceed to the turn around at the end of the road. The bike is out and back with rolling hills. Run: Run is a mixture of single track trail and asphalt. Beginning at the Transition Area, athletes head north from the parking lot along the street for approximately 1 mile where they will veer right on to a single track trail towards Millerton park entrance. Athletes will turn left to exit the tail and head back to transition on the road. Swim: Beginning in the water at Millerton, athletes will utilize Millerton Lake Boat Launch. Participants swim around buoys for 1600 yards, exit the water at the boat ramp and proceed to the Transition Area. Bike: Beginning at the Transition Area, athletes will make their way north towards the Millerton park entrance and proceed to the turn around at the end of the road. The bike is out and back with rolling hills. Olympic athletes will ride do two loops on the bike course. Run: Run is a mixture of single track trail and asphalt. Beginning at the Transition Area, athletes head north from the parking lot along the street for approximately 1 mile where they will veer right on to a single track trail towards Millerton park entrance. Athletes will turn left to exit the tail and head back to transition on the road. Two loops of the course. Run is a mixture of single track trail and asphalt. Beginning at the Transition Area, athletes head north from the parking lot along the street for approximately 1 mile where they will veer right on to a single track trail towards Millerton park entrance. Athletes will turn left to exit the tail and head back to transition on the road. Run is a mixture of single track trail and asphalt. Beginning at the Transition Area, athletes head north from the parking lot along the street for approximately 1 mile where they will veer right on to a single track trail towards Millerton park entrance. Athletes will turn left to exit the tail and head back to transition on the road. Two loops of the course. Sunday Event Parking: Be prepared to have a parking pass or $10 cash at the event. Volunteer Parking: Volunteers that do not have a parking pass, we will pay for your parking on Sunday morning. Carpool if you can, there is no free parking. We will have to pay for each volunteer that parks. 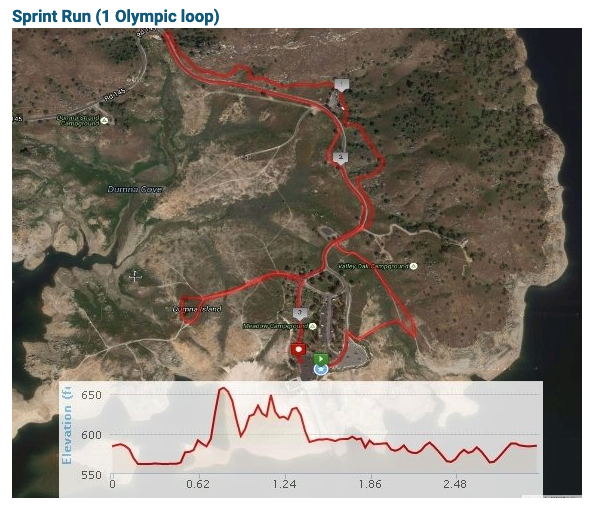 How was Millerton Lake Triathlon, Duathlon, 5K & 10K?